Are you looking to add vision to you current machine automation process or looking to upgrade to a newer system? We offer the solutions to do both. 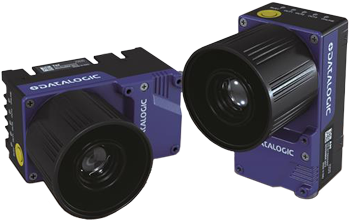 Our feature machine vision partner Datalogic offers a complete selection of standalone smart cameras and vision processors designed to make integrating vision a simple and cost effective process. Smart cameras are stand-alone industrial digital cameras with built-in controls and software for processing images. Smart cameras are used for a wide variety of applications including inspection and quality control, position and orientation, robot guidance, and many others. Models are available with image resolutions and features to match any application. Vision processors are general purpose, industrialized machine vision inspection systems that allow for incredible flexibility in programming. With a wide range of available high-resolution cameras, vision processors can deliver the right solution for general purpose machine vision needs or specific application inspection requirements. Models are available to control up to 4 digital cameras and a variety of processors up to the powerful Intel® Core™ i7 quad-core microprocessor. For more information on machine vision solutions visit onexia.com/datalogic or contact one of our engineers to discuss your potential application.